1. Never agree to a trip that's longer than half a day long. 2. You absolutely MUST wear a helmet. 3. Tie the life jacket they give you REAL tight. 4. Once you step into the BIG RUBBER RAFT there's no getting off. 5. You have to sit on the EDGE of the raft with no harness, nothing holding you in the raft except gravity. 6. Once the raft starts down river THERE"S NO GETTING OFF! 7. If you fall out of the raft, float downriver FEET FIRST. Don't worry they give you a chance to practice this. 8. Don't waste time asking yourself why do you have to float downriver FEET FIRST. It'll eventually dawn on you. 9. 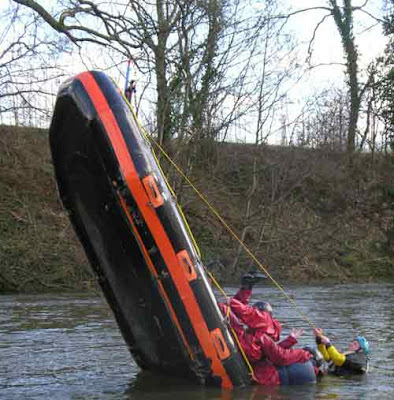 Don't worry about getting back in the raft after practicing floating downriver, they get you back in somehow. 10. Don't whatever you do, fall into the center of the raft. The lead rafter will YELL at you. 11. 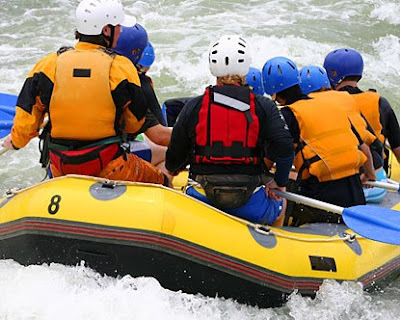 When you hit those first rapids, hold your head down and lean in toward the center of the raft. DON'T FALL INTO THE CENTER OF THE RAFT, I told you! 12. When they start stringing a line across the river above a particularly rough set of rapids, don't ask why they are doing that. YOU WON"T LIKE THE ANSWER. 13. Absolutely NEVER, NEVER go white water rafting in a country whose medical and/or helicopter services are of questionable quality. I'm more likely to do a parachute jump (Not that either) than go white water rafting but thanks for the tips. During the last two trips to GA, we drove through Ocoee, where the olympic whitewater rafting events took place. Those rapids scared the bujeebus outta me. 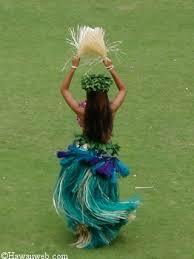 But they are sooooo beautiful! # 15 keep your camera dry. 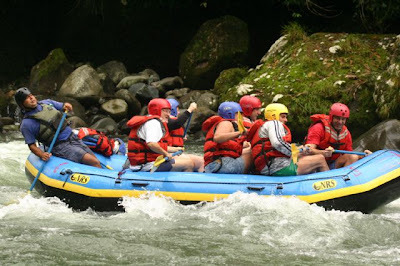 White water rafting is a lot of wet fun, but certainly those rocks that make the water white are hard on the body when you are in the middle of the raft! Nice set of 13 tips! Wow sounds scary! I liked #10 the best. It's always fun to do something "fun" while getting yelled at at the same time! The only rafting I'm doing is in my pool. Your T-13 brings back mem’ries of the several times I’ve been ‘white-water rafting’ … but in those days they didn’t give us ‘helmets’ to wear. I wonder when they started that? The only raft I've ever been on was at a Disney water park. That's as rapid as I'll ever get! You lost me with the "no getting off" part. No way. Nohow. No. Nope. Just no. Wow. I don't think I could ever do this! that was a great TT! I am already drowned by looking at the pictures ! That was a good read, Mary! I remember getting out of one of those and wondering what happened to my legs. THey had gone to rubber! I think I'm past this stage of life, I'll just settle for a Flippin Ranger Bass Boat!!! Nope, the town is real, and the story is mine. Wow. I always wanted to do this and I think you just talked me out of it.